Whether you like the styling changes to the 2015 WRX or not, the new performance model gets significant new suspension and performance upgrades. The changes Subaru made to the new-generation performance model will definitely make it quicker in the corners. Isn’t that why Subaru performance enthusiasts buy this car? They will take it to the track and challenge others on the weekend. What improvements were made and how will it change the driving dynamics of the new 2015 WRX? It now gets 268 horsepower and 258 lb ft of torque. But the engine is an all-new 2.0-liter FA turbocharged version of the new Forester 2.0 XT powerplant. But the WRX version uses different cams and higher-rate valve springs and other enhancements to enhance the performance envelope. The WRX engine uses a combination of direct injection, high compression (10.6:1), Subaru Dual Active Valve Control System (D-AVCS), a twin-scroll turbocharger and an intercooler to get improved performance over the Forester version. It also gets a broader torque curve and peaks at 258 lb.-ft. over a 2,000-5,200 rpm engine speed range. A big difference between the new-generation WRX and the outgoing model is the new 2.0-liter engine replaces the larger 2.5-liter Boxer engine. But it produces more power, and the most significant improvement comes in its weight reduction and engine placement. The new powerplant sits lower in the chassis for better weight distribution and will give the 2015 WRX better handling in the corners. Subaru learned this from the BRZ. And it will also be fast on the straights. Subaru says it will launch from 0-60 in just over 5 seconds. For 2015, the Subaru WRX gets upgrades to the suspension and chassis. The new-generation WRX features a new torque-vectoring system that supplements the standard Symmetrical All-Wheel Drive system. The Torque vectoring should improve cornering speeds and handling in the curves. WRX also comes with a new and stiffer chassis, larger brakes, and performance-tuned suspension. 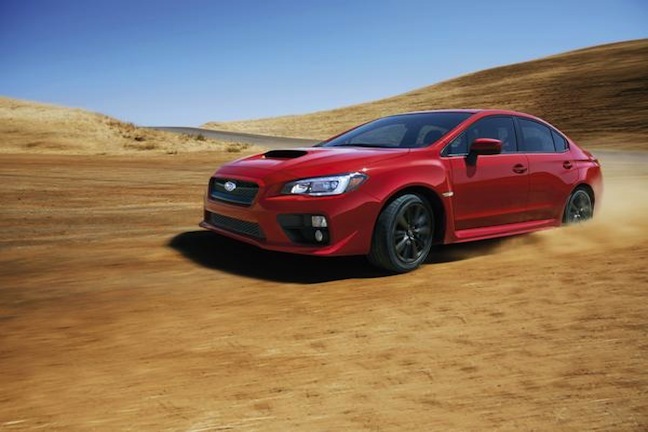 The 2015 WRX will feature a new six-speed manual gearbox that provides a wider ratio spread than the previous five-speed. It also incorporates several performance and durability improvements for this high-performance application, including carbon synchronizers on first and second gears and a short-throw shifter for quicker shifts. WRX also comes with a new, optional performance automatic transmission, the Sport Lineartronic CVT with two manual modes. The new automatic uses the CVT for better fuel efficiency but also benefits from a choice of stepped automatic shifting with eight pre-selected ratios. It can be manually shifted in Sport Sharp mode, and also six-speed and eight-speed manual shifting modes using steering wheel paddle shifters. The new CVT uses a new feature called Subaru Intelligent Drive (SI-DRIVE), a powertrain performance management system that allows the driver to tailor the vehicle’s driving characteristics by choosing from among three selectable modes, “Intelligent,” “Sport” and “Sport Sharp” – using a switch on the new flat-bottom steering wheel. When equipped with the CVT, WRX comes with a new Variable Torque Distribution (VTD) version of Symmetrical All-Wheel Drive. It features a planetary gear-type center differential and an electronically controlled hydraulic transfer clutch control torque distribution between the front and rear wheels. It splits the torque 45:55, with the rearward torque bias contributing to handling agility. The VTD system continually optimizes torque distribution in response to driving conditions and input from steering wheel angle, yaw and lateral g-force sensors. It also gets a new Electronic Power Steering system, that combined with the sport-tuned suspension, 235/45 R17 94W Dunlop SP Sport Maxx RT tires, stiffer chassis and new engine placement, this new 2015 Subaru WRX should have markedly improved handling and driving dynamics on the track. Click here for a detailed look at the new premium cabin upgrades. Watch WRX World Premiere Movie.